When Sarah Maddock searched the Internet for her name back in the early 2000s, she had no idea that nearly 20 years later she’d be commemorating a ride from Sydney to Melbourne by her namesake Sarah Maddock 125 years earlier. 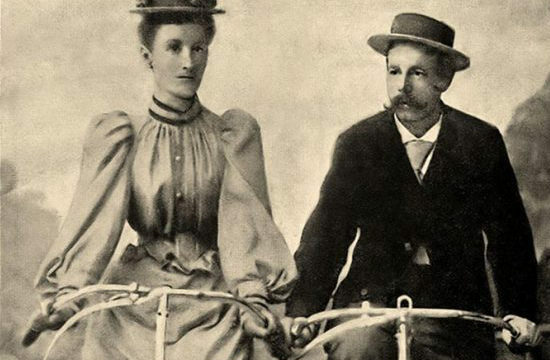 A woman named Sarah Maddock was a trailblazer of women’s cycling and rode with her husband from Sydney to Melbourne in 1894, the first woman to complete such a feat. The ride was planned as a cure for her husband’s ill health and Sarah who apparently was quite shy about her achievement, was surprised when many people along the way came out to cheer her along. Their route followed the Great South Road, which is today’s Hume Highway. They averaged 100km a day, travelling light carrying a change of clothes on the handlebars of their New Rapid and Conqueror bikes. Sarah rode in silk bloomers when she was away from the towns but always arrived in towns with her more modest skirt. 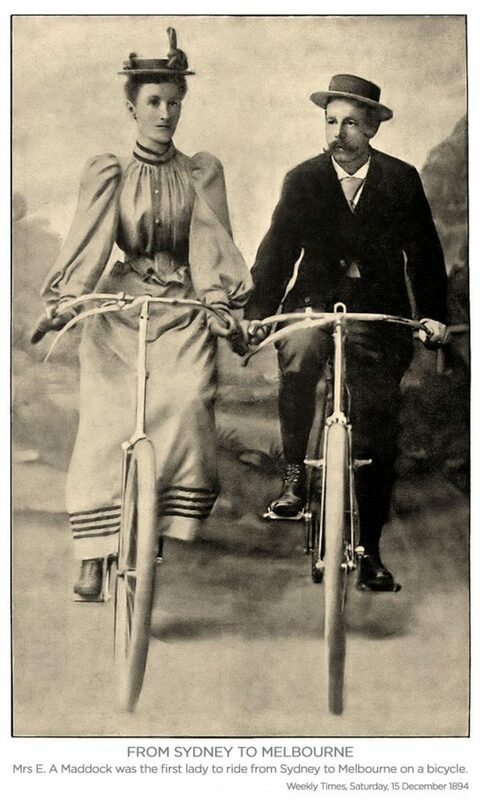 She apparently was not fond of the ‘rational dress’ that had been adopted at that time by women riding bicycles. 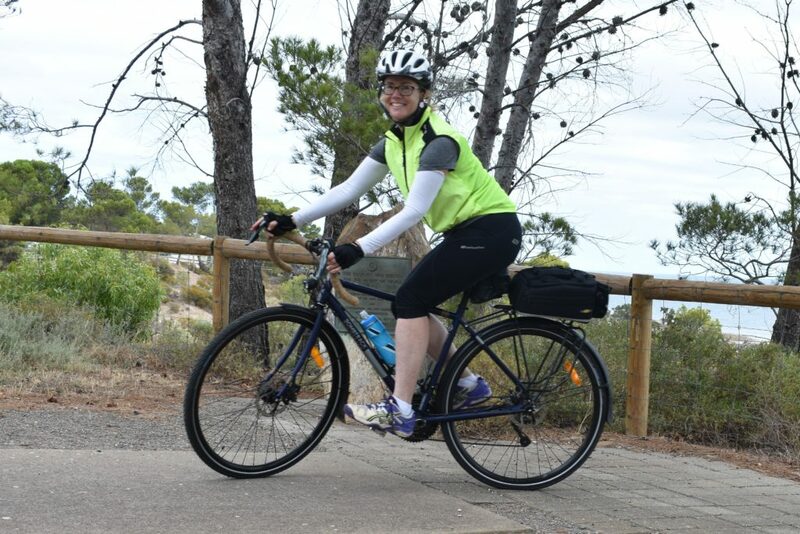 Modern day Sarah Maddock had no plans to repeat her famous namesake’s feat when she first came across her in the early 2000s but it remained dormant in her mind until she started running bicycle tours in Adelaide some years later. She recalled the amazing accomplishment and started planning her own ride from Sydney to Melbourne. She actually got quite a long way down the planning of the ride in 2018 which she was going to complete with just one friend, until an accident stopped her. So when she started planning the 2019 version she decided to approach a company that already ran cycling tours of a similar nature and that’s when she found Mulga Cycling Tours who will be running the tour. The 2019 tour will not follow the exact route of Sarah’s 1894 ride mainly because that would mean following the Hume Highway which would not be particularly enjoyable. Instead the ride will take in some new towns such as Cootamundra and Wagga Wagga and in Victoria we will explore the Murray to Mountains and Great Victorian rail trails, which will give a sense of what the scenery and ambience, would have been like for Sarah and Ernest. In 1895 Sarah Maddock followed her Melbourne ride with a ride that was a roundtrip from Sydney to Brisbane with her husband which was another first. We also have Sarah to thank for her trailblazing work to get more women riding where she helped form a number of women’s cycling clubs. In February 1895 seven women met at Quong Tart‘s tea-rooms to form the Sydney Ladies’ Bicycle Club with Mrs Maddock as captain. Next year she estimated that there were 1,000 women cyclists in NSW. In 1897 she formed a second women’s club, the Stanmore Wheelers. About 40 women also joined her as members of the new and predominantly male Cyclists’ Touring Union. As for modern day Sarah, she’s training hard for her Sydney to Melbourne ride in late August this year. When I asked her if she was excited about the trip, she was a little hesitant, and said she was mostly excited and that her naivety with get her through the 14 day ride. Have you got any famous namesakes who have done amazing things like ride from Sydney to Melbourne? Share your experiences via comments or the Women Who Cycle Facebook page.